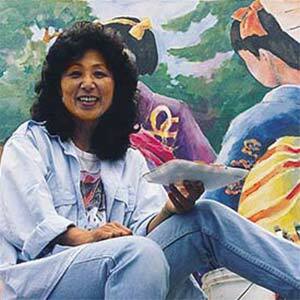 Born in Steveston, BC and raised in Japan, Joyce Kamikura came late to life as an artist. When she returned to Canada in 1956, she studied to obtain a degree in Commerce and Business Administration. Only in 1982 did she return to college to formally study art. She has since worked as a full-time artist. The painting of The Winning Float was a challenge in which Kamikura wished to achieve a sense of the ethereal light and transparency of watercolour, as well as capturing the richness of the pigments found in traditional Japanese fabrics. Kamikura works in watercolour and mixed media, and has developed a style recognizable for its jewel-like colours and sense of movement. The artist has achieved recognition in many exhibits in Canada and internationally. Her works may be found in collections as far afield as England and Japan.